Copper, gold and blush – so pretty and perfect for Fall. Right? Kind of obsessed with this palette – and that Rachel Zoe dress! And Gold cake? Awesome sauce. What do you guys think? Whooo I have to stop reading this blog – i am changing my theme every time I see a new post. I love that gold cake!! So fab! I’m pretty sure I HAVE to have that dress. And I’m not even getting married, it’s amazing. Looks so expensive lol~ But they are really gorgeous! I L.O.V.E. this board! So feminine and soft, yet in a beautifully modern and classy way! Gorgeous. I’m loving this resurgence of gold! It was nothing but silver there for a while. So awesome! The cake looks so good. I love using Gold Luster from Chef Rubber on desserts like that. It is perfect for even a beginner cake decorator! Go to the website, check out the disco dust too! LOVE LOVE LOVE…this is my color pallette with the addition of cream! can anyone tell me who designed the gold cake in the photo? fabulous! What a beautiful inspiration board. 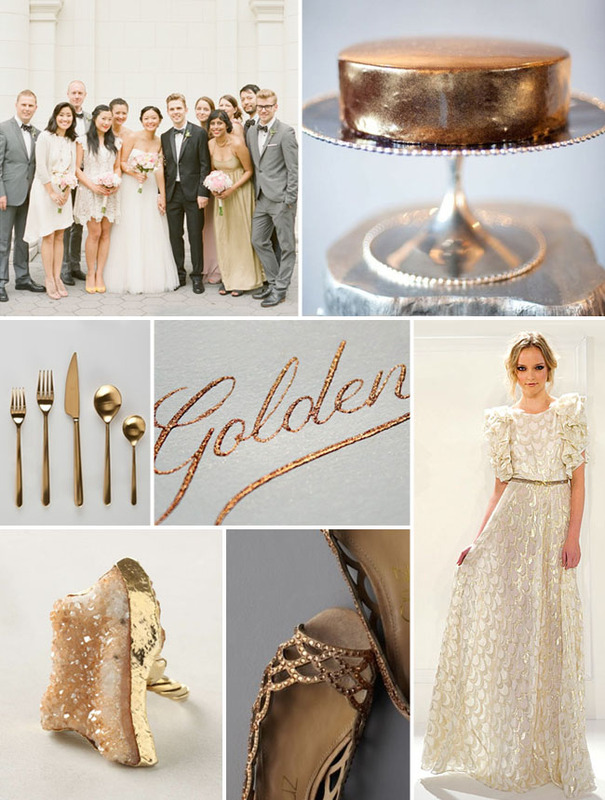 I’m thinking blushes for our wedding and the gold is a beautiful compliment…. Something to consider! really love the copper and gold colour scheme, the dress and the cake are amazing.